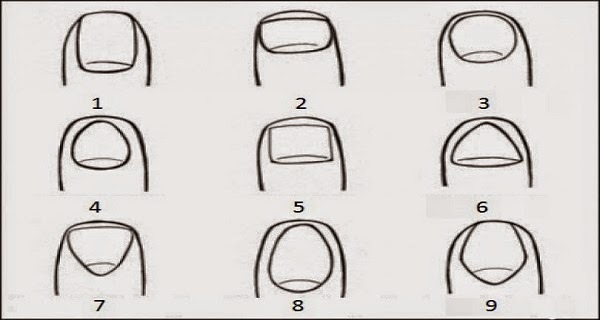 What The Shape and The Size of Someone’s Nails Speak About His/Her Personality!? Throughout the centuries there were different ways that could supposedly determine someone’s personality by just one look. These theories and beliefs often connect certain body parts with the characteristics of a person. Some presume that the size and the shape of the nails can determine the personality. There is even science called phrenology dedicated to analysing the character features based on the measuring of the skull in the past and it was believed that the proximity of someone’s eyes is a sign of an artistic talent. The current trends are focused on the shape of the nails. Initially, it started in Asia and since then, it also spread in the west. In principle, everything depends on you and how deeply you read, how much do You really believe in these things, because no matter how precise it is, it is still fun. Here is the reading according to the photo above. Find your shape and number and read what kind of a personality are you. 1. Vertical long nail – mild temper, precise, creative. These people are generally getting on well with everyone. 2. Wide nails – sincere, without absurdities, short tempered, theoreticians. These people always speak the truth, no matter what and they often give advices to other people. 3 and 4. Round or egg shaped – These people are relaxed, unique, positive and reasonable. They live with their own rhythm and they do not allow small things to destroy their lives, which means they have many long-term friends. 5. Square shape – They are leaders, strong, skillful and brave. Tey are often very serious and people see them as leaders, but they also have a soft side which is reserved only for their close ones. 6 and 7. Triangle or invert nails – smart, perfectionists, innovative, original. It is possible that these people are geniouses and think faster than the others. Usually other people are fascinated by them. 8. Almond shape – True, sincere, friendly, beautiful. These people are very kind although they are standing firmly on the ground when that is necessary, people enjoy their company and love te way they solve problems. 9. Sword shape – inspirative, productive, visionaries, focused. They are focused on longterm aims and see the “wider picture”, they influence people by reqarding and their positive way.